Of the younger men of wealth none has shown a keener interest in the sport, or has done more, particularly abroad, to demonstrate the superiority of Amer­ican models, than Howard Gould, third son of the late Jay Gould. From the time when as a boy he played about the deck of the Atalanta, his father's pleasure craft, and watched the white­ winged craft go sailing by with their parties of gaily dressed young men and women, whose laughter and songs made sweet music in his ears, young Howard found his chief joy in yachting. He was twenty-two years of age when he became master of the Hildegard, loaned him by his brother George. The following year, with him he purchased the Vigilant, the victorious defender of the America's Cup, and took her abroad to try her speed in English waters. He was disappointed in the showing made by the yacht, and decided to build a boat which should demonstrate to the world that instead of being merely unstable vessels suitable for sailing in light winds, as the English yachtsmen had claimed, Yankee yachts are superior to all others in any weather. The order was placed with the Herreshoffs at Bristol, R.I., and in the spring of 1895 the fin-keel, twenty-rater sloop yacht Niagara was launched Mr. Gould took the yacht abroad, and dur­ing that season, with John Barr, for­merly commander of the Thistle, as her skipper, sailed her in nearly every re­gatta held in English waters. Out of fifty races in which the Niagara was entered she won twenty-nine first prizes, nine second, and one third prize. Such a transatlantic record had never before been made by any American yacht. Among the trophies which her owner brought back to New York as the result of his first season's work as an independent and patriotic yachtsman were the Lord Dunraven Castle Yacht Club Challenge Cup; a silver tea set and tray presented by Robert Cross for the Royal Western Yacht Club; silver punch bowls from the Clyde, Corinthian, and the Royal Albert Yacht Clubs; and silver loving-cups from the Royal Western of England and the West of Scotland Yacht Clubs, in ad­dition to the H. Maitland Kersey Cup presented to the Castle Yacht Club. 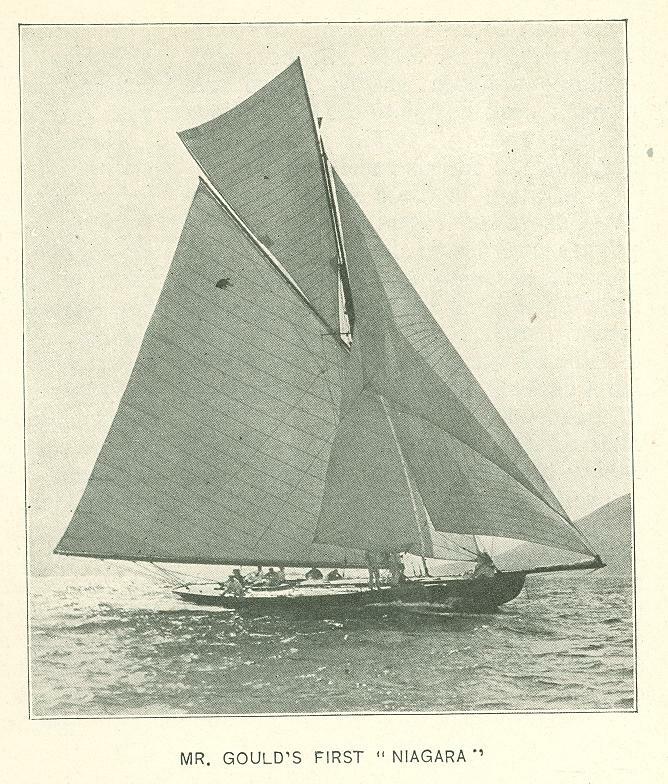 In 1896 the Niagara again competed with English yachts, but her victories were not as numerous as during the previous season, although she won twenty out of forty races in which she participated. 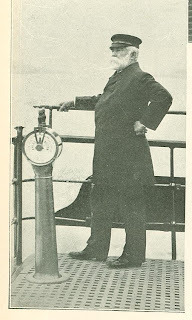 During these two summers Mr. Gould, through his fairness and sports­manlike conduct, established himself firmly in the regard of the Irish, Scotch, and English yachtsmen. He was shown every possible attention and honor by them, and was made a life member of the Royal Ulster Yacht Club and an honorary member of the Douglas Bay (Isle of Man) Yacht Club and the Royal Cork and the Start Bay Yacht Clubs. He was also elected a member of the Royal Largs, the Royal Alfred, and the Royal Teaple Yacht Clubs. 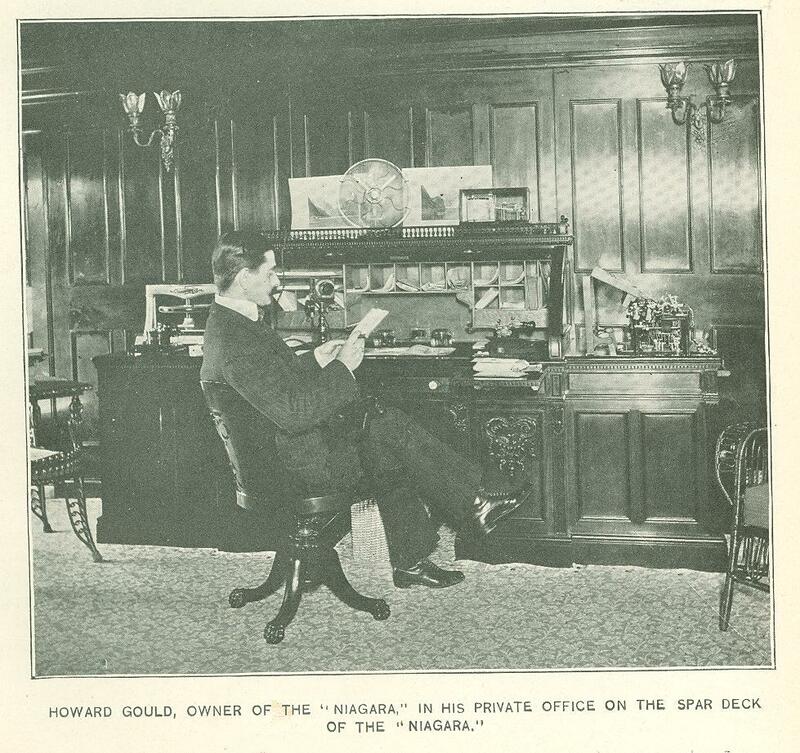 Prince Henry of Battenberg, at his own re­quest, was Mr. Gould's guest during one of the Niagara's races. 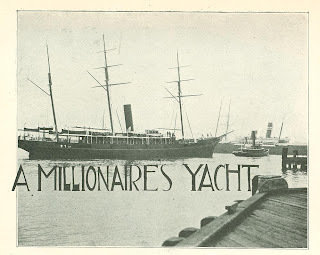 Although well pleased with his expe­riences in sloop yachting, Mr. Gould, in the spring of 1897, placed with the Har­lan & Hollingsworth Co. of Wilmington an order for the building of the largest steam yacht ever constructed in the United States. 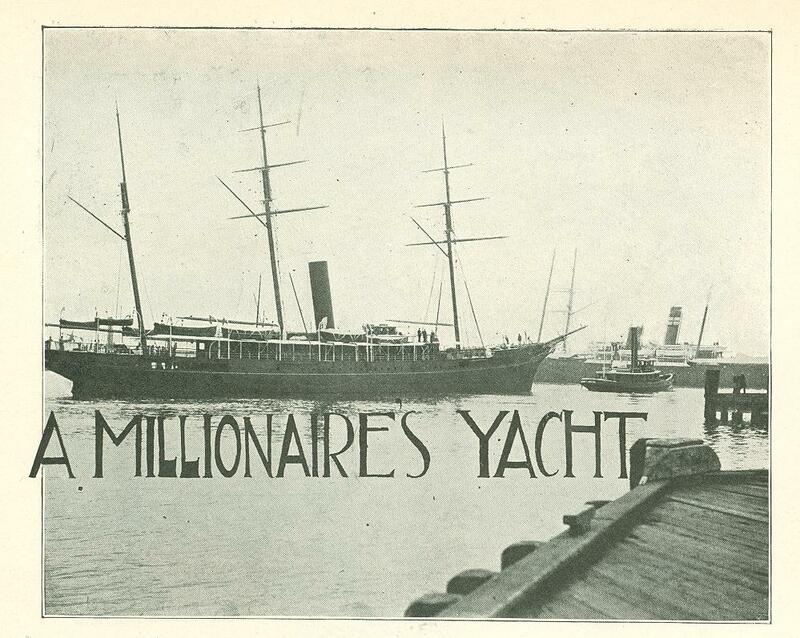 She was launched Feb­ruary 19th, 1898, in the presence of a great crowd of people, including many New York yachtsmen, business and newspaper men. The Niagara - for that was the name under which she was christened - was not turned over to her owner until the latter part of August. The Niagara represents the highest type of naval construction as applied to a pleasure craft. She has the graceful lines of an ocean greyhound, the luxuri­ous appointments of a palace, the conveniences of a modern hotel, and the comforts of a home. She was not built for speed, the additional space which extra boilers, furnaces, and coal supply would occupy being devoted to increasing the size of the living rooms and in supplying accommodations not usually found on a yacht. Mr. Gould's idea in the construction was to make it the most perfect floating home ever de­vised - a boat which would be able to cross the sea and battle with its waves and the storms that sweep over it under all circumstances. The yacht, which is bark-rigged, is modeled on lines designed by her com­mander, Capt. 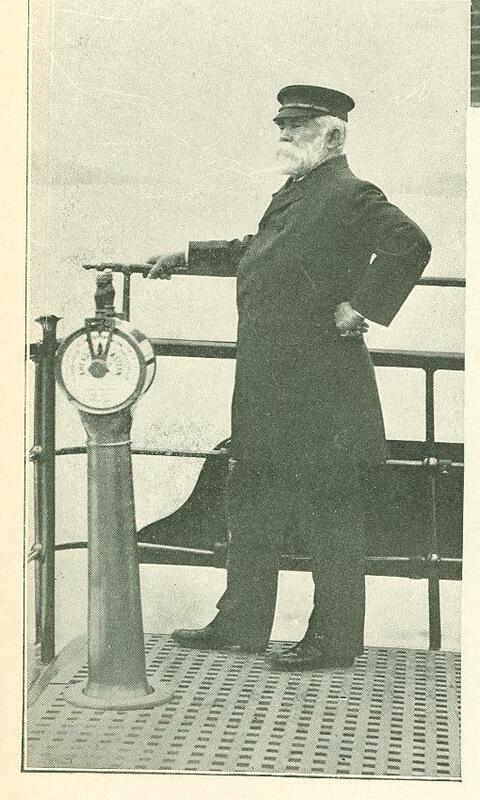 W. G. Shackford, late captain of Jay Gould's yacht Atalanta. Captain Shackford began his seafaring career in the days of the clipper ships. During the Civil War he was an officer of the United States navy, and after­ward became commodore of the Pacific Mail Steamship Company's fleet. He is one of the ablest and most experienced officers that ever trod the quarterdeck. The Niagara stands well out of the water, her head proudly lifted as if con­scious of her beauty, and bearing upon her breast a handsomely carved Ameri­can eagle, all shining with gold and carrying a shield emblazoned with the stars and stripes. In point of tonnage she is equaled by only half a dozen yachts in the whole world, her tonnage being 1,445 tons and her displacement 1,558 tons. She is 272 feet 4 inches long, 36 feet beam, 27 feet 5 inches in depth, and 16 feet 9 inches draught. There are no striking innovations in the structure of the Niagara's hull, the two points in which she differs from other yachts being in the employment of bilge keels, 140 feet in length and 17 inches deep, similar to those suc­cessfully tested last year on the crack Cunard liners to prevent rolling, and the use of Captain Charles G. Lund­borg's device for protecting the out­board shafting of the twin screws. In the case of the latter the hull is carried out to enclose the shafts, thus making them integral parts of the structure and doing away with the usual steel hangings which are so liable to be broken or bent under slight pressure. 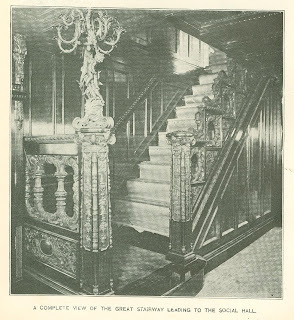 The spar deck of the Niagara offers an unbroken promenade the entire length of the vessel, the awnings spread overhead shutting out the glare of the sun and affording a grateful shade to the guests of the young millionaire as they walk up and down the white, holy stoned deck or recline in the restful easy chairs that lie scattered about. The house on this deck, 110 feet long and 16 feet wide, is built of steel and covered with mahogany. Above this at the forward end and on a level with the bridge, which is furnished with every modern device for signaling to the most distant part of the ship in the briefest possible time, is the wheel house, which will be used in rough weather. A dial on the wall shows the location of every bulkhead door and tells whether it is open or closed. The boat equipment of the Niagara includes a 35-foot steam launch capable of a speed of 10 1/2 miles an hour; a 24-foot naphtha launch, two 23-foot lifeboats, a 22-foot gig, an 18-foot market boat, and two dingeys. The yacht will also carry the fastest one-rater that can be built. Whenever desirable the boat will be entered in regattas. Mr. Gould's purpose being to stimulate and encou­rage the building and sailing of small yachts. 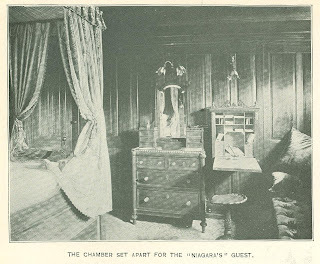 It is the interior of the Niagara, however, that arouses the greatest enthusiasm among those who have been on board; not that the furniture and the decorations are richer and more expensive than those found in other pleasure craft, but because of the unique arrangement of the rooms, which are larger and more convenient in their appointments than one could expect from the size of the yacht, and the refined taste shown in the selection of every piece of carving, tapestry, or carpeting employed in giving beauty to its apartments. The credit for all this belongs to Miss Kathrine Clemmons, Mr. Gould's fiancee, who has been untiring in her devotion to the work. It was Miss Clemmons who laid out every room in the Niagara, plotting the entire interior to a scale so accurately that when the builders came to work out the plans in actual practice they were not obliged to change a single one of her meas­urements. 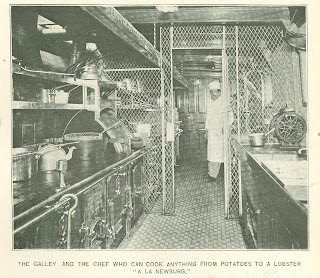 With Mr. Gould's assist­ance she selected the woods, the electric light fixtures, the draperies and the carpets for each room, and when the workmen came to put them in place on the yacht she was on board nearly every day superin­tending their labors, in order to see that instructions were properly car­ried out. It was this careful at­tention to detail combined with good judgment on Miss Clemmons' part that has made the arrange­ment of the Niagara's interior the most homelike and convenient of any yacht yet constructed. The owner's and the guests' living apartments are as absolutely private as they are in a town house. They are completely cut off from those occupied by the crew, and cannot be visited except under orders. The officers and men have their own dining room, recreation hall, and com­panion ways. This arrangement assures the greatest privacy, and many of the annoyances which have hitherto pre­vailed on steam yachts may thus be avoided. One thing which has contrib­uted to this desirable end is the elimi­nation of the conventional and univer­sally prevalent grand staircase leading from the dining saloon to the upper deck. All of this space has been utilized in adding to the size of the din­ing saloon on the main deck and to the social hall on the spar deck. The dining saloon, a magnificent apartment 36x24feet in size, is finished in hand-carved quartered oak and dec­orated with old Renaissance tapestry. At one end is an open fireplace enclosed with slabs of delicately tinted Mexican onyx, above which rises an elaborately carved mantel of oak bearing in bold relief a representation of Diana stand­ing, spear in hand, ready for the chase. Directly opposite the fireplace rests an upright piano in a massively carved oak case which matches the rest of the apartment. Three tapestry panels in the top complete its decorations. On four sideboards of stout oak curiously carved are displayed the owner s elab­orate dinner service in gold and silver. Ten large porthole windows and two skylights of tinted glass flood the sa­loon with sunlight during the day, and at night scores of electric bulbs half hidden in the ceiling diffuse a soft mel­low glow over the apartment. The pantry opening off the dining room is as large as those usually found in city houses, and communicates di­rectly with the kitchen or galley. Mr. Gould's chef, one of the best in New York, presides over a kitchen of which he may well be proud. Its walls are covered with white enameled tiles, and the floor with serviceable vitreous blocks arranged in appropriate designs. It is fitted with every modern appliance for the prompt preparation and speedy service of meals, including an electric range and heater. Mr. Gould is not a gourmet, his preference being for plain, substantial food rather than for the elaborate compositions of the French school of culinary art, but he desires his guests to suit their own tastes and provides liberally for their gratification. The library, a stately apartment on the main deck, is one of the most im­pressive on the yacht. 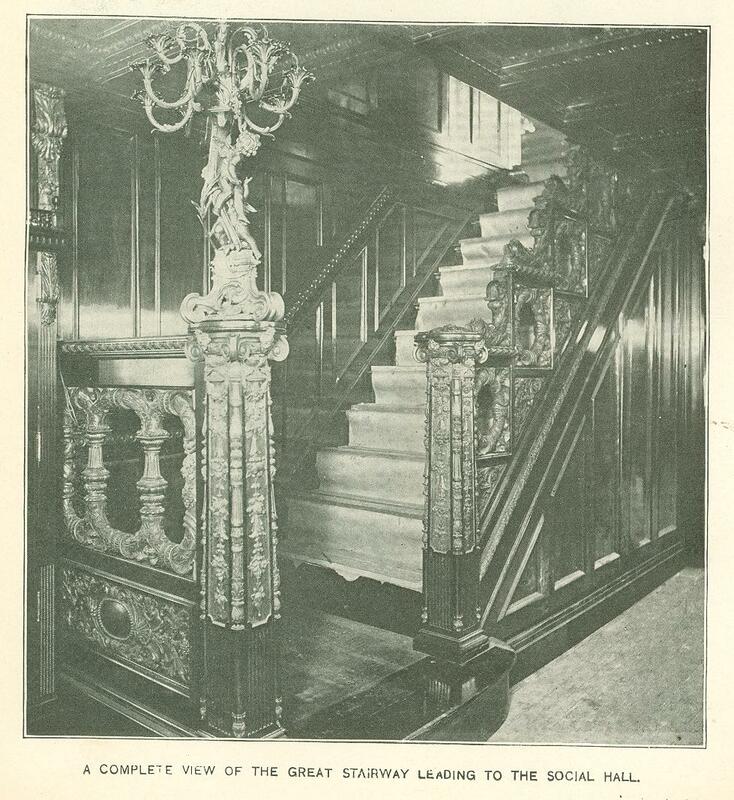 It is reached from the dining saloon by a wide arch­way, and from the social hall on the deck above by a broad stairway, the balustrade of which is one of the best examples of black walnut carving pro­duced during the year. The latter is composed of a series of massive wreaths joined at the top by graceful garlands. One of the newel posts supports an artistic group of bronze figures which holds aloft a tropical bush in whose branches glow lamps burn. The library is finished in Amer­ican black walnut with hangings of Venetian red. Around the walls stand bookcases filled with over 600 volumes of novels, biographies, travels, etc., suited to every taste. At one end are two covered glass cases containing a well selected complement of arms, such as revolvers, cutlasses, rifles, and swords, to be used in case of emergency. A writing desk, a wall cabinet for bric-a-brac, a broad leather cov­ered seat just suitable for lounging, and some easy reading chairs complete the furnishings of the room. On a yacht of palatial size the owner's suite is usually regarded as the chief object of interest. On the Niagara, however, this distinction be­longs to the state apartments. This suite, located on the port side, is a dainty dream of loveliness in ivory and rose of the Louis XVI. period. The draperies about the portholes, the royal canopy of rich silk above the couch of spotless white, the velvet carpet upon the floor, into which the feet sink with­out a sound, are of a delicate shade of rose, in which garlands and bows of ribbon are worked in graceful design. The commodious dressing room is bril­liantly illuminated from the ceiling by glow lamps set in tulip shaped opales­cent glass shades. A large, full ­length, three-leaved folding mirror is an accessory of this room which every woman can appreciate. Leading from this room is a private hall connecting with the boudoir, a chastely elegant apartment corresponding to the dress­ing room in general tone effect. The globes of the electric lamps are half ­open roses of opalescent glass. Wall cabinets of French plate glass, on whose crystal shelves gleams a dainty china tea service; a beautiful writing desk of the Louis XIV. period; a long, low divan piled high with silken cushions, and, above it, an Oriental canopy, from which hangs a colored glass lan­tern of novel design, are among the attractions of the apartment. A bath room all in ivory and rose tiles, fitted with an electric, tub, and foot baths, completes the suite. Mr. Gould's suite, con­sisting of three rooms on the starboard side of the yacht, is finished in natural birch with drap­eries in Yale blue. No attempt has been made at luxurious display in the furnishings of these rooms, the owner's com­fort alone being sought. The sleeping chamber contains a brass bed un­der a blue silk canopy, a roll-top desk, a bureau, and a long mirror. The bath room, which is un­usually complete for a yacht, is tiled through­out and contains a show­er and needle bath, a porcelain tub, and a porcelain foot bath. Forward of these two suites are four guest chambers, each nearly 12 feet square and finish­ed in a different kind of wood, and each provided with a private bath room. One is in curly maple, another in sycamore, the third in prima vera, and the fourth in Cali­fornia redwood. 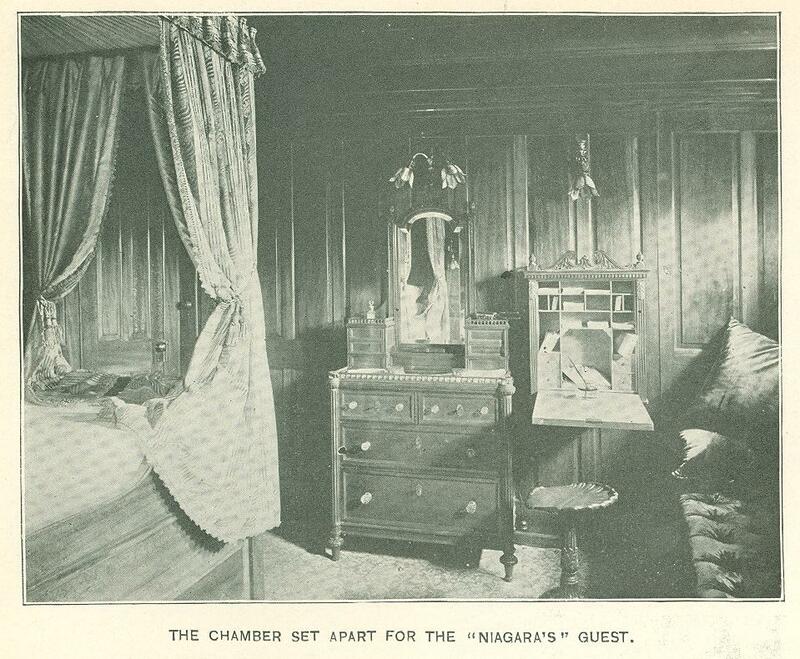 On the lower deck are three more guest chambers of the same character, though finished in dif­ferent woods, and, like them, provided with private bath rooms. Each is fur­nished with a brass bed, a bureau with a large plate glass mirror, a wall writ­ing desk, and a cedar lined clothes closet. For the comfort of his guests Mr. Gould has provided a number of special rooms. The largest of these is the social hall on the upper deck, 16 feet wide and 32 feet long, finished in Afri­can mahogany and upholstered in dark green. Wide windows, consisting of single panes of heavy plate glass, fur­nish plenty of light and afford an excellent opportunity for observation in rainy weather. A concert orchestrion, equivalent to a band of eighteen pieces, furnishes music for dancing or plays the latest songs and instrumental compositions whenever desired. Around the skylight in the roof growing foliage and running plants are arranged in such a manner as to give a conserva­tory or garden effect. Just abaft this hall is the smoking room, in old oak, fitted with big easy chairs and comfortable lounging divans covered with soft Venetian leather. A sideboard stocked with liquid refreshments and cigars, and a card table, add to its attrac­tions. The walls are decorated with old Dutch Delft plaques, the globes over the electric lights being of a design which harmonizes. with them. A second social hall, 18 feet square, is located on the lower deck. 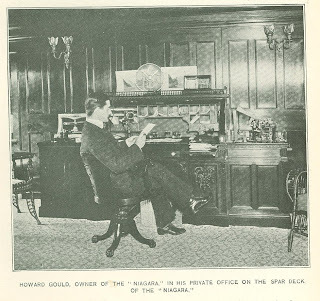 Mr. Gould's private office on the spar deck is a plain but richly furnished apartment in East Indian mahogany, with green damask curtains and a dark green carpet. It contains a large mahogany desk, a typewriter cabinet of the same material, an invit­ing divan covered with velvet cushions which can be used as a bed, two reclin­ing chairs, and a table. Sconces with opalescent green shades above the owner's desk complete the decorations of the room. Captain Shackford's stateroom is on, this same deck. In addition to those already enume­rated there are rooms for Mr. Gould's private secretary, doctor, valet, and personal servants; an apothecary shop, a photographer's room, a fully equipped steam laundry, a refrigerating plant capable of turning out 400 pounds of ice a day and cooling 1,500 cubic feet of space to a temperature of 34 degrees Fahrenheit; a hospital, and a room for fishing tackle and camping outfit. The Niagara's electric plant is as complete as was ever put on board a ship. It consists of two dynamos cap­able of furnishing 400 sixteen-candle power lamps, and a storage battery of eighty-lamp capacity. On nights when an illumination is desired 900 lights, outlining the hull, masts, and spars of the yacht, can be used at one time, in addition to the great searchlight on the bridge. The part which electricity plays upon this palatial craft is a most important one. It runs the big or­chestrion in the social hall, cooks steaks in the kitchen, warms the rooms, lights cigars, operates the laundry machinery, heats my lady's curling tongs, carries messages over the telephone wires, summons the servants, and cools the air with whirling fans. The engines of the Niagara are of the triple expansion, inverted cylinder, direct-acting, surface condensing type, with a working pressure of 160 pounds to the square inch. The cylinders are 18, 28, and 45 inches respectively, with a 30-inch stroke. The steam is supplied by three Scotch boilers, each hav­ing three furnaces. There are two sets of engines, so that in case one set becomes disabled the yacht can still proceed under the other. The coal bunkers have a capacity of 450 tons, a quantity sufficient to take the Nia­gara to Southampton and back at a twelve knot speed. The contract speed of the boat is fourteen knots an hour. She is classed under the highest clas­sification at English Lloyds and United States standard, being for a twenty ­year rating under special survey. Howard Gould, the owner of the Ni­agara, is a well built young man slightly below the average height. He is twen­ty-seven years old, has dark hair and moustache, and a pair of kindly but keen brown eyes. Those who know him intimately say that he has more of the characteristics of his distinguished father than either of his brothers. He is certainly not fond of display and cares nothing whatever for society. He is quiet in dress and considers American tailors abundantly able to supply him with correct clothes. He is conservative in making acquaint­ances and extremely careful in select­ing his friends. Those who enjoy the latter honor find in him a liberal enter­tainer and a delightful companion, whose loyalty under all circumstances never wavers. He is a member of the New York Stock Exchange, a director of the Missouri Pacific and Iron Moun­tain Railroads, and president of the Tubular Dispatch Company. There is nothing wishy-washy about Mr. Gould's character, whatever his other traits may be. Whenever he makes up his mind on a question­ - which he does only after long and careful consideration - his decision is final and admits of no reversal, no mat­ter what pressure may be brought to bear upon him. Although a member of the Atlantic, American, Larchmont, Seawanhaka, and New York Yacht Clubs and a number of social organi­zations, he rarely visits their club rooms. He goes to the theatre or opera only at long intervals, and spends the most of his evenings in reading, in chatting with his friends, or in the study of navigation, in which he ex­pects to take out a master's license next year. On the upper deck of the Niagara, just under the bridge, is the owner's navigation room and nautical library, fitted with every needed acces­sory for the continuance of his studies while at sea. Originally published in the Metropolitan Magazine. October 1898.